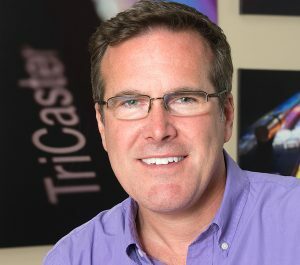 NewTek was founded in 1986 by inventor Tim Jenison. Jenison’s Video Toaster, the world’s first “television studio-in-a-box”, ignited the desktop video revolution. In 2005, NewTek introduced TriCaster, the most complete multi-camera video production system, giving content creators solutions to create their own network-level shows and stream them directly to audiences. Today, NewTek continues to be a change-agent in the video industry, leading the shift to IP video workflows with the NewTek IP Series and NDI (Network Device Interface). With innovation at the heart of the company’s philosophy, vice president of product management, Brian Olson, reviews the recent products on show at Las Vegas. NAB is still in our minds. What particular part of your solutions excited visitors to your stand? From my perspective, it was the overall critical mass that NewTek has reached with NDI and IP workflow, along with the ever-increasing breadth of our product line that now delivers complete solutions – from acquisition with cameras through production, enhancement, and all the way to delivery. We didn’t seem to disappoint anyone and had answers for most of our customers’ problems. Of the standout products we introduced, our NC1 Studio I/O IP Module was really comforting to broadcasters who have or are planning to invest in SMTPE ST 2110. The NC1 I/O IP provides a gateway between NDI and 2110, allowing customers to invest in NDI workflows while still being compatible with a SMPTE IP core. At NAB you worked with Vizrt and Cisco to show virtualised products. What is involved with this collaboration? Cisco was kind enough to allow both NewTek and Vizrt to showcase our virtualised solutions in their booth at the show. NDI was used to pass signals between our IP Series NVP (NewTek Virtualised Product), a 44-input, IP-native, 4K-capable live production system, and Vizrt’s Opus compact control room product. In addition, Cisco is also a valuable partner working with NewTek on virtualised production proofs-of-concept with top-tier broadcasters. Has the integration of IP Technology been as rapid as you anticipated? What can be done to improve the take-up? The integration of IP technology in broadcasting was moving slowly until the ratification of ST 2110 at IBC last year. Since then, we’ve seen more interest not only in 2110 products, but also in NDI products and workflow. It’s almost like the “IP dam” broke and customers are now able to start planning and making purchasing decisions. I don’t know that NewTek can do much more to improve the speed at which this is moving. It is somewhat of an organic process, but it now has real momentum behind it. We’ve had IP customers and facilities for several years now, but you should expect to see many more in the near future. NewTek LiveGraphics has been described as a breakthrough. What makes it so special? LiveGraphics at its core is the new ability for NewTek live production systems to have integrated high-end motion graphics without external software or hardware. That is revolutionary for our existing customers, but the real breakthrough lies in what I’ve always called “the holy grail” of motion graphics – the ability to make Adobe After Effects compositions play in real-time. It’s something that designers have wanted to do since AE first hit the market 20+ years ago. Using our LiveGraphics Creator Plug-in for After Effects, non-experts can create complex motion graphics that can be exported to either TriCaster TC1 or NewTek IP Series for playout live-to-air with replaceable text, images, and the ability to link templates to live data. How does Connect Spark Pro benefit sports broadcasters and production companies? Connect Spark Pro offers sports video professionals the ability to take 4K signals directly from cameras, gaming consoles, or other devices and bring them into the IP domain with NDI directly at the source, making it much easier to move 4K signals around. What are the challenges facing you for the next twelve months? I think we are going to see a lot of IP projects in the next 12 months with some of those ultimately involving virtualisation. This is new territory for a lot of people, so there will be lots of education involved, as well as workflow design and implementation challenges. The good news is that this is going to be a much smarter and economical way to work with lots of problems solved and enhanced production values. Can you share a European case study with this, please? MediaNews is an Italian production company that has been operating for over 30 years, largely working in the sports sector. It has long-standing working relationships with some of the biggest European sports institutions, including: Fox Sports, CEV Champions League, Basketball NCAA, Lega Pallavolo Serie a Femminile, Lega Nazionale Pallacanestro and Bettelmatt Ultra Trail. At the end of 2017 the company’s SDI-based OB van was approaching end of life, and it was decided to take the opportunity to equip a new vehicle with the latest IP technology. 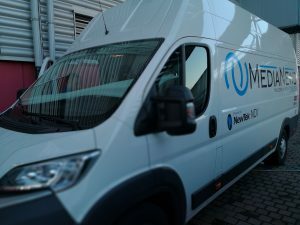 Roberto Musso, CEO/CTO at MediaNews, said that his team had been following the progress of the NDI protocol and decided to build the new van based around NDI and Dante for a complete IP-based system. The main advantages are the tremendous flexibility it gives compared to a normal SDI workflow, and also the time that is gained when setting up for an event. The van houses a NewTek IP Series Video Mix Engine at its heart to accommodate its ambitious workflow including hybrid SDI/IP, 4K Ultra HD and fully virtualised production. Using the Video Mix Engine, MediaNews can operate within a virtualised environment, connecting with other compatible technologies through software and move video across its network infrastructure for increased efficiency, flexibility and productivity. MediaNews is developing its wireless solutions and has recently invested in NewTek’s Connect Spark, with WIFI portability, direct recording, multi-cam virtual PTZ and multicast mode. This eliminates the usual set up hassles and expenses as no computer modifications or extra devices are required for video over IP. To create attention-grabbing titles and graphics, the team use NewTek’s LiveText software which enables them to send and edit titles through the TriCaster 8000 over the network in real time. The OB van is also equipped with NewTek NDI Telestrator, a software tool for enhanced productions to draw diagrams or illustrations in real time to inform, educate and entertain audiences. MediaNews’ extensive investment in NewTek’s adaptable, compact and flexible IP network technology has been one of the reasons for its success and the acquisition of rights to broadcast numerous internationally recognised sporting events and institutions, including the 2018 CEV Volleyball Champions League. Using its new NDI-based OB van, MediaNews live-streamed five volleyball matches to produce a TV event with KU satellite and produce a highlight package post-match.